Slater’s 50/50 is home to the iconic award-winning half ground bacon, half ground beef burger…hence the name Slater’s 50/50. It was created in 2009 Scott Slater, who has a passion for burgers, bacon, and beer. He decided to take these three loves and create a menu that offers burgers with exceptional craft beers that are like no other. 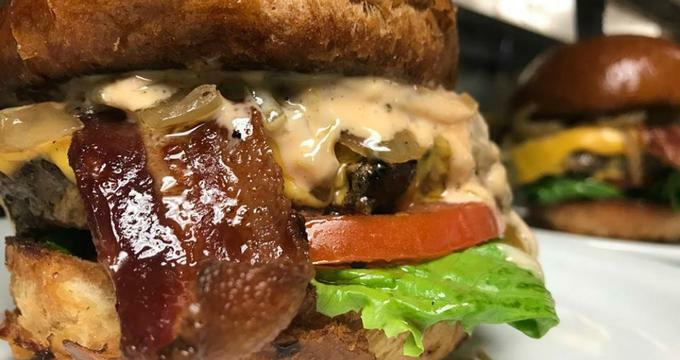 At Slater’s 50/50, diners continue to enjoy a menu filled with delicious endless burger possibilities that one can only dream of. Slater’s 50/50 operates seven locations throughout California and Texas. The following are the applicable days and hours of operation. Reservations are highly recommended and can be made by calling the location of choice directly or by placing a reservation through Nowait. Slater’s 50/50 will build an outdoor kitchen at the desired location and prepare all menu options on the spot for guests to enjoy. Slater’s 50/50 offers and participates in a number of events throughout the year. From VIP dinners to special events, there is always something to get into while enjoying exceptional burgers at Slater’s 50/50. Give the Slater’s 50/50 Excesstasy™ burger experience to a special someone by purchasing a gift card. Gift cards are available via standard mail or email and are available in denominations from $20 to $500. Patrons can enjoy a number of discounts and perks by joining the 50/50 VIP Club. For $30/month, members enjoy one beer a day at any of the California Slater’s 50/50 restaurants. There is also the opportunity to enjoy early tastings of the Burger-of-the Month as well as invitations to multi-course dinners.